This is going to be my first thread in khinsider and I hope you all enjoy it. This place in were donald and goofy were sleeping , we know that sora have been sleeping inside different room and different capsule . if you see this picture here you will notice that there are like 6 capsules totally , 2 were used for donald and goofy so that left 4 other capsules . the question is : what do you think they were made for ? and for who ? 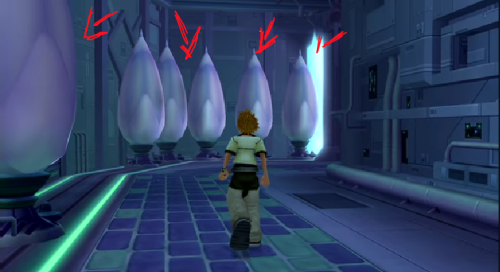 and the most mystreies thing is that if you pressed x next to one of these capsules , a massage will tell you that ( THIS CAPSULE HAVE BEEN USED NOT LONG ) or something like that , that means that THERE HAVE BEEN SOMEONE ELSE SLEEPING BEFORE OR DURING SORA , DONALD AND GOOFY WERE SLEEPING.